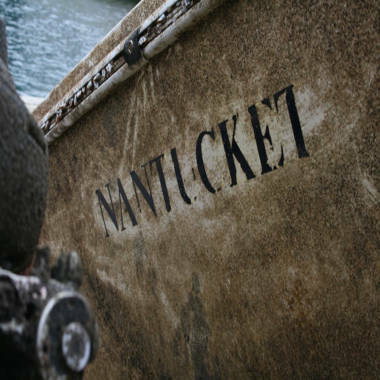 The boat of a man who was tossed off his vessel in the waters of Nantucket more than three years ago has washed up in Spain. WNBC-TV's Katy Tur reports. NEW YORK -- As he swam toward the coast of Nantucket, Mass. in August 2008, Scott Douglas, 58, watched his yellow fishing boat disappear, carried away by the swelling surf. He thought it would be the last time he'd ever see the Queen Bee. But Tuesday, more than three years after Douglas and his brother-in-law were tossed off the boat by a wave, the U.S. Coast Guard called to say the vessel had washed up on the Spanish coast. It was rusty and covered in barnacles, but intact. "It looks entirely different," Douglas said upon seeing the photos. "That's amazing." Douglas remembers the water was restless on the day he set out to sea, and the fish weren't biting. He tried to keep the boat stationary, bracing himself as huge rollers crashed into it. "At all times, it's a very sketchy area," Douglas told msnbc.com. "You wouldn't want to be dumped in the ocean there." But that's exactly what happened when a rogue wave knocked Douglas and his brother-in-law, Rich St. Pierre, off the boat and into a sink-or-swim fight for survival. Douglas remembers thinking the water was not too cold. "The only way I was going to survive was just to get started, not tread water," he said. But swimming didn't come as easy to St. Pierre, 68, who had gone through open heart surgery a year earlier. However, a survival kit containing an inflatable device had been knocked off the boat and floated to St. Pierre's side. It was a miracle, Douglas said, noting that the kit was the only item from the boat in the water with them. Scott Douglas, 58, watched his yellow fishing boat disappear in 2008, carried away by the swelling surf. He thought it would be the last time he'd ever see the Queen Bee. Douglas swam for about an hour and made it to shore on Smith's Point, a beach off the coast of Nantucket. Dripping wet and exhausted, he walked up to a cabin and asked to use the phone to alert the Coast Guard. Not long after, he saw St. Pierre walking on dry land. "At the end of the day, it just wasn't our time," Douglas said. While that marked the end of their ordeal, the Queen Bee's journey didn't end there. Lt. Joe Klinker, a U.S. Coast Guard spokesman, said the most likely scenario is that the boat somehow got across the continental shelf and into the Gulf Stream. "From there it may drift north off the coast of northern Canada and then east with the North Atlantic currents," Klinker told msnbc.com. He said it's rare, but not unheard of for an object off the coastline of the United States to drift across the Atlantic to Europe. But a boat? "I've never heard of anything like this," Klinker said. It's not uncommon, he said, for the Coast Guard to locate derelict ships from Florida off the coast of Virginia, or vessels from Virginia off the coast of Massachusetts, but never in Europe. The ability to withstand the hardships of the Atlantic has a lot to do with the make of the boat, Klinker said. The Queen Bee is a 26-foot center console fishing boat made by Regulator. "It probably could have floated for another three years," Klinker said. The Spanish Coast Guard alerted their U.S. counterpart Tuesday. Based on salvage law, the boat now belongs to Spain. Douglas, who is now retired and lives in New Jersey, said he doesn't want the boat back. But with four grandchildren, he has thought about turning Queen Bee's story into a children's book. "It's interesting to see what life takes and gives," he said.